Needed Adapters: 43mm - 52mm step-up ring. Camera specific reversing ring (52mm threads). Street Price: $40-$100 in good used condition. Prices vary a lot online, shop around. 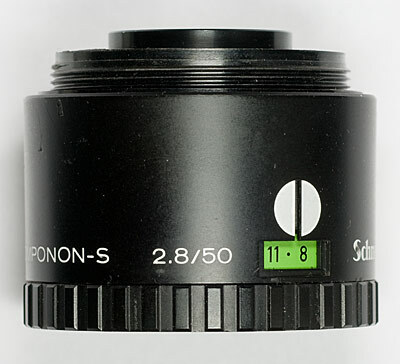 Controls: This lens has an aperture control and an aperture preset ring. 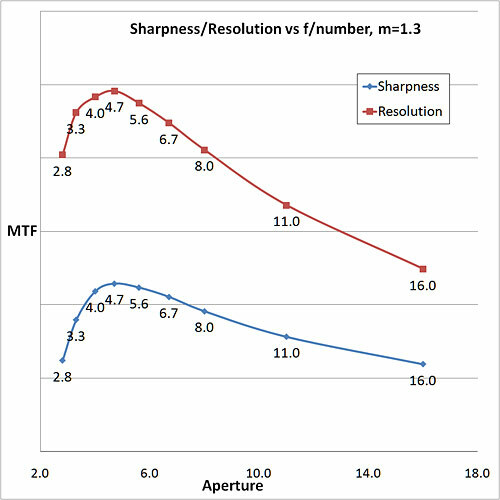 The sharpest aperture is f/4.7, better than average for a lens of this focal length. 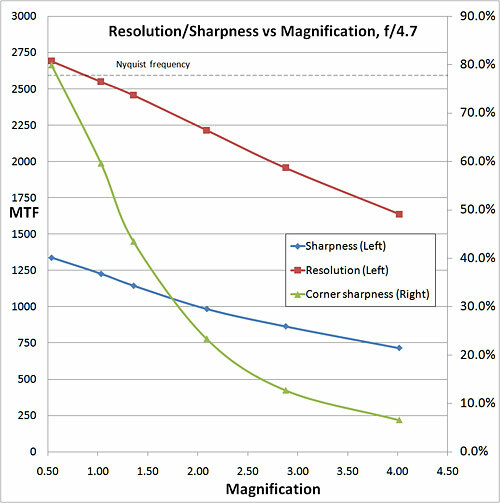 Most are sharpest at about f/5.6, with the exception of the Nikon 55/2.8 micro at f/4. 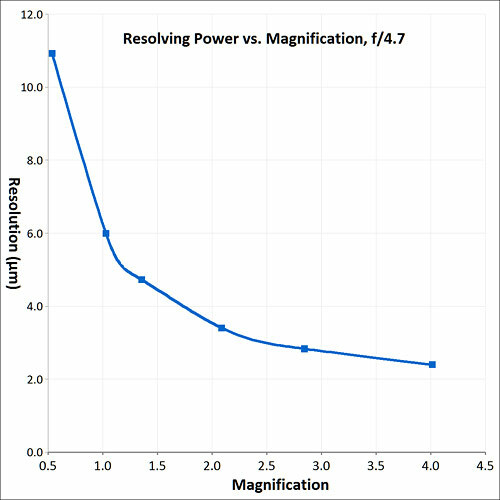 The most resolving aperture is also f/4.7. This means that f/4.7 is a good aperture to shoot at for sharpness and resolution. 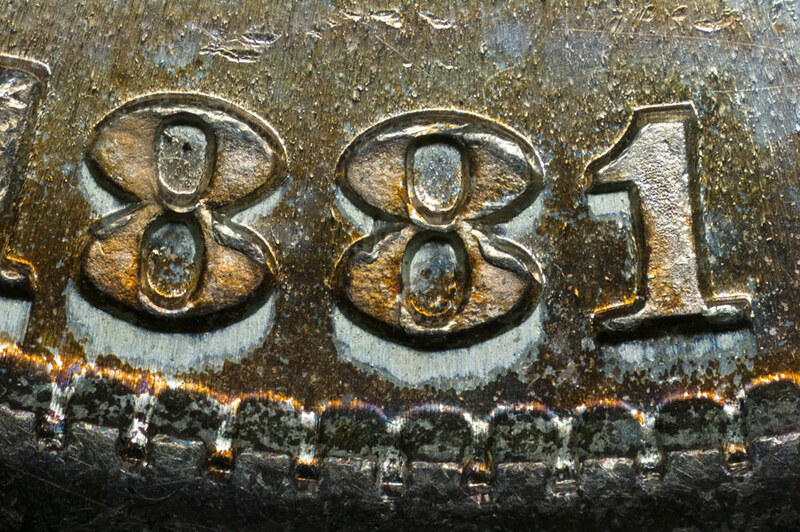 The only drawback to using f/4.7 is the not so hot corner sharpness at lower magnification (see next section). The corner sharpness of the lens is OK at the sharpest aperture of f/4.7 although you will likely be able to see a little fuzziness on the periphery at this aperture, especially at low magnification. If you want sharper corners you can shoot images at f/5.6 or f/6.7 although you will pay a small price in sharpness and resolution. 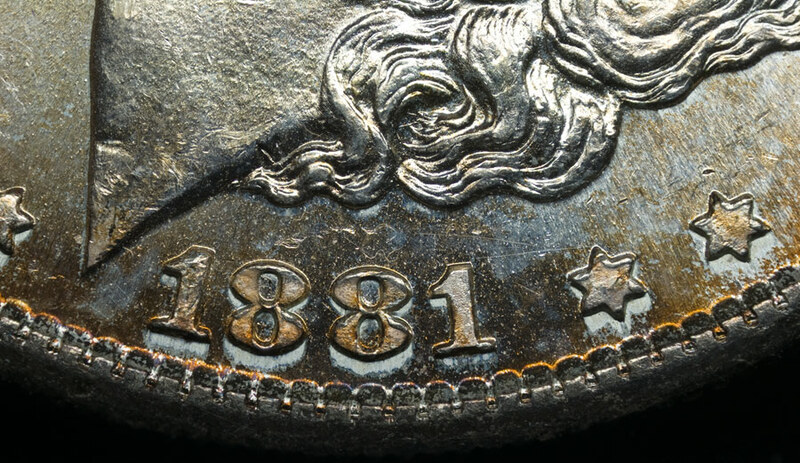 If you are shooting images at the lowest magnification (no bellows), clicking the aperture closed a notch or two will significantly improve things. This lens show the best resolution and sharpness of any 50mm enlarging lens that I have yet tested and provides very good resolution and sharpness from 1:1 to 4:1. 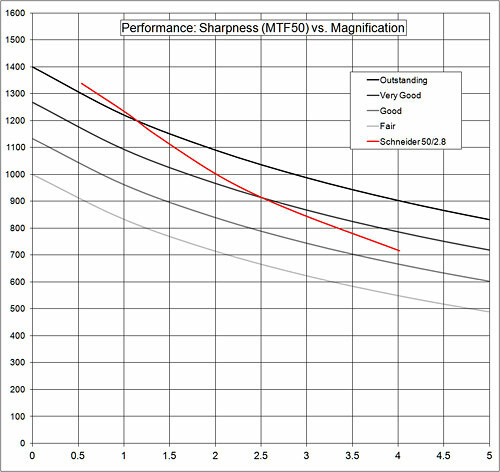 The MTF50 (sharpness) stays above 1000 lp/ph up to about 2:1. There aren't very many lenses that will outperform this lens across this range. Above 2:1 you will have to go to significantly shorter focal length lens to outperform this lens, giving up significant working distance to improve the performance. The corner sharpness is not so hot below 1:1 and OK to very good above 1:1. Below 1:1 you will likely benefit from stopping the lens down a notch or two. 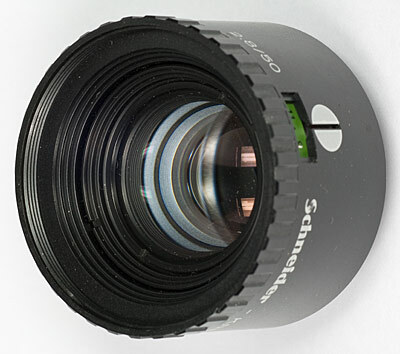 The Schneider 50mm shows sharpness varying from outstanding below 1:1 to good at its highest magnification. 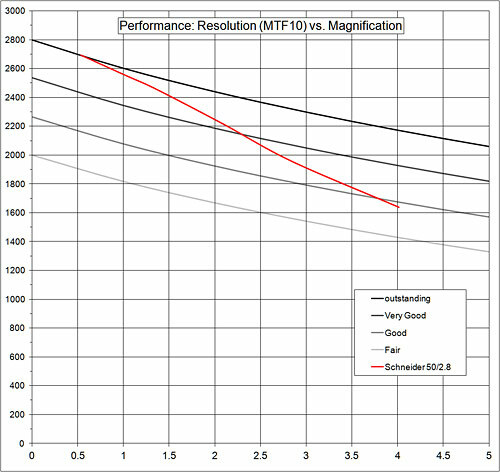 The Schneider 50mm shows resolution performance varying from very good at low magnification to predominantly good a high magnification. Good to very good resolution, no problems. 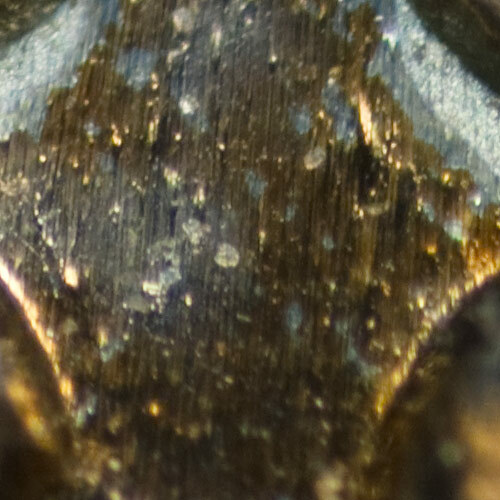 Chromatic Aberration: This lens show minimal color fringing in the center (less than 0.25 pixels) and minimal to moderate on the periphery (0.10 - 1.5 pixels). The moderate is seen at magnifications below 1:1. Anything below 1.0 pixel is good. Image Contrast: Image contrast is good. Good pixel level detail. 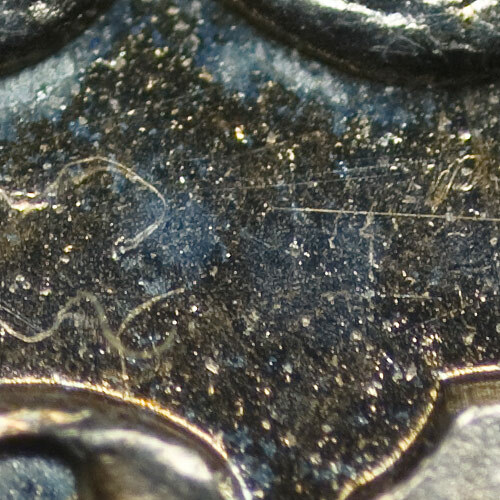 The coin is tilted somewhat for this image and the area of sharp focus is in the center of the image. Again, good detail, no problems. Again the in focus area is in the center of the image. This is an easy to find and relatively inexpensive enlarging lens that preforms better than any 50mm enlarging lens that I have yet seen (I have 6 different ones). This lens has very good sharpness and resolution across the magnification range of about 1:1 to 4:1 and performs at its best at f/4.7. There is good working distance for the magnification and no visible distortion. Chromatic aberrations are well controlled. Corner sharpness is the only real downfall of this lens and it isn't so bad at f/4.7, at least above 1:1. 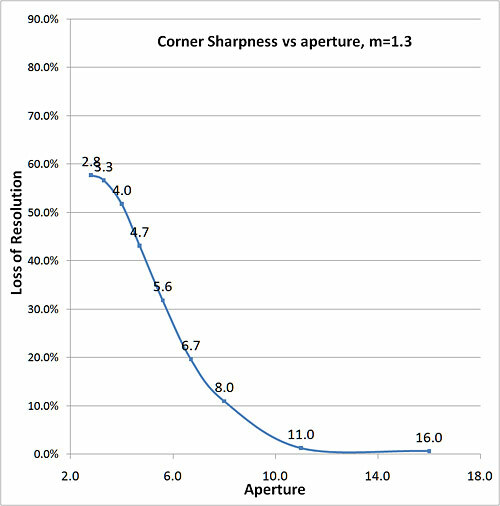 The corner sharpness improves significantly at f/5.6 and f/6.7 although you will pay a small price in resolution and sharpness when shooting at smaller apertures. This lens requires a bellows or extension tubes to focus and works best when reversed (at least above 1:1 magnification). I would recommend this lens as a good adition to a typical macro lens.